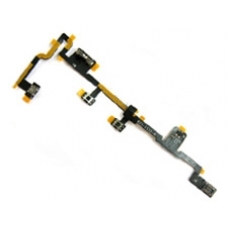 iPad 2 power button, volume and mute button flex cable. This part is very easily damaged when removing the touch screen on the iPad 2, you can easily rip the flex cable which can remain attached to the touch screen upon removal. Leaving you with non working power button, volume or mute button. This is a complete iPad 2 power button, volume and mute button flex cable. Replace your damaged power and volume flex cable with the brand new one, restoring your buttons back to full working order.